When a mild-mannered Uber driver named Stu (Kumail Nanjiani) picks up a passenger (Dave Bautista) who turns out to be a cop hot on the trail of a brutal killer, he's thrust into a harrowing ordeal where he desperately tries to hold onto his wits, his life and his five-star rating. Directed by Michael Dowse, this action-comedy from 20th Century Fox also stars Iko Uwais, Natalie Morales, Betty Gilpin, Jimmy Tatro, Mira Sorvino and Karen Gillan. 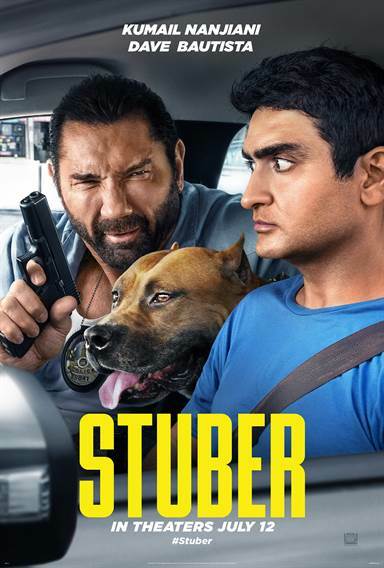 Stuber images are © 20th Century Fox. All Rights Reserved.